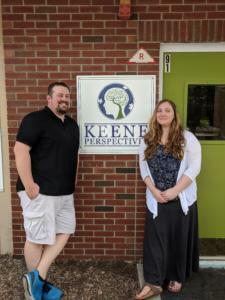 Cortney and Chris Keene had spent over a decade in the fields of education and behavioral health when they decided to open their own clinic, Keene Perspectives, in February. Together they had a unique understanding of how applied behavior analysis (ABA) could be applied to create learning experiences for children with autism and other developmental disorders. They knew their approach worked, having seen successful outcomes in schools across Vermont. For 13 years Cortney taught special education, provided behavioral services, and consulted with schools across the state. Meanwhile, Chris had earned his PhD at Dartmouth College studying behavioral neuroscience to understand how learning and memory function at the neural level. They are both board certified behavior analysts (BCBA) as well. The couple had a dream of opening their own clinic, where they could draw from their combined experience and knowledge to provide individualized intervention for children in need. But like many would-be entrepreneurs, they needed help turning their idea into a reality. So they reached out to the Vermont Small Business Development Center (VtSBDC). Their VtSBDC advisor, Ross, helped them come up with ways to monitor the financial performance of their business. He also provided them with valuable insights about how to manage the risks of early growth and set realistic expectations for the future. Ross walked them through the process of securing a small business loan and coming up with an actionable plan to use those resources to help build their business quickly and sustainably. Today, the Keenes are doing what they set out to do: changing lives for the better. Keene Perspectives, based in White River Junction, provides early intensive behavioral intervention and social groups for children with developmental disorders. They also offer parent training, school workshops and consultation.